2018-2021 Marie Curie research fellow at British Antarctic Survey (UK). Global Marie Skłodowska-Curie Individual Fellowship (MSCA) grant number 792773: West Antarctic Margin Signatures of Ice Sheet Evolution (WAMSISE). 2017-2018: Researcher at the Department of Geophysics at the Geological Survey of Denmark and Greenland (GEUS; Denmark). Geocenter Danmark project: Sedimentary processes in the Arctic Ocean: tectonic, oceanographic and climatic implications. 2015-2017: Postdoctoral fellow at the Department of Geophysics at the Geological Survey of Denmark and Greenland (GEUS; Denmark), studying the seismic architecture of the northeast Greenland margin in the framework of the ‘Glaciated North Atlantic Margins (GLANAM)’ project (Marie Curie Initial Training Network: ITN–FP7-PEOPLE-2012-ITN) grant number 317217. Supervisor: Tove Nielsen (GEUS). 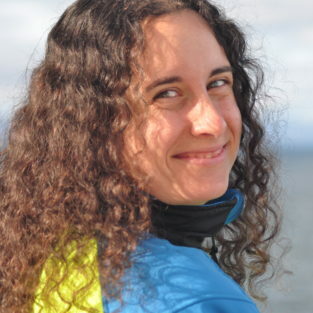 2011-2015: PhD candidate at the Instituto Andaluz de Ciencias de la Tierra – CSIC-UGR (Spain), studying the tectonic and stratigraphic evolution of the Scotia Sea – Antarctica, in the PhD project: ‘Onset and evolution of the Scotia Sea oceanic basins (Antarctica): tectonic, sedimentary and palaeoceanographic implications’. Spanish Research Council (CSIC): JAE-Predoctoral studentship. Shephard, G.E., Wiers, S., Bazhenova, E., Pérez, L.F., Mejía, L.M., Johansson, C., Jakobsson, M., O’Regan, M. A North Pole thermal anomaly? Evidence from new and existing heat flow measurements from the central Arctic Ocean. Journal of Geodynamics, 118, 166-181. DOI:10.1016/j.jog.2018.01.017. Pérez, L.F., Nielsen, T., 2017. Asynchronous ice sheet development along the central East Greenland margin: a GLANAM project contribution. Geological Survey of Denmark and Greenland Bulletin, 38, 61-64. García, M., Lobo, F.J., Maldonado, A., Hernández-Molina, F.J., Bohoyo, F., Pérez, L.F., 2016. The contourite depositional systems of the Scan Basin, southern Scotia Sea, Antarctica: Recent sedimentary processes and conceptual implications. Marine Geology, 378, 361-373. DOI: 10.1016/j.margeo.2016.01.011. Lodolo, E., Pérez, L.F., 2015. An abandoned rift in the southwestern part of the South Scotia Ridge (Antarctica): Implications for the Bransfield Strait genesis. Tectonics, 34 (12), 2451-2464. DOI: 10.1002/2015TC004041. Pérez, L.F., Hernández-Molina, F.J., Esteban, F.D., Tassone, A., Piola, A.R., Preu, B., Violante, R.A., Lodolo, E., 2015. Erosional and depositional contourite features at the western Scotia Sea-southern Atlantic Ocean transition: links with regional water mass circulation from middle Miocene to Present. Geo-Marine Letters, 35, 271-288. DOI: 10.1007/s00367-015-0406-6. Galindo-Zaldívar, J., Puga, E., Bohoyo, F., González, F.J., Maldonado, A., Martos, Y.M., Pérez, L.F., Ruano, P., Schreider, A.A., Somoza, L., Suriñach, E., Díaz de Federico, A., 2014. The magmatism, structure and age of the Dove Basin (Antarctica): a key to reveal the South Scotia Arc development. Global and Planetary Change, 123, 249-268. DOI: 10.1016/j.gloplacha.2014.07.021. Maldonado, A., Bohoyo, F., Galindo-Zaldívar, J., Hernández-Molina, F.J., Lobo, F.J., Lodolo, E., Martos, Y.M., Pérez, L.F., Schreider, A.A., Somoza, L., 2014. A model of oceanic development by ridge jumping: opening of the Scotia Sea. Global and Planetary Change, 123, 152-173. DOI: 10.1016/j.gloplacha.2014.06.010. Pérez, L.F., Maldonado, A., Bohoyo, F., Hernández-Molina, F.J., Vázquez, J. T., Lobo, F.J., Martos, Y. M., 2014. Depositional processes and growth patterns of isolated oceanic basins: the Protector and Pirie basins of the Southern Scotia Sea (Antarctica). Marine Geology, 357, 163-181. DOI: 10.1016/j.margeo.2014.08.001. Ruano, P., Bohoyo, F., Galindo-Zaldívar, J., Pérez, L.F., Hernández-Molina, F.J., Maldonado, A., Medialdea, T., García, M., 2014. Mass-transport processes in the southern Scotia Sea: Evidence of paleoearthquakes. Global and Planetary Change, 123, 374-391. DOI: 10.1016/j.gloplacha.2014.06.009. Somoza, L., Leon, R., Medialdea, T., Pérez, L.F., Gonzalez, F.J., Maldonado, A., 2014. Seismic evidences of the occurrence of fluid flow and gas hydrates in the Scotia Sea. Global and Planetary Change, 123, 359-373. DOI: 10.1016/j.gloplacha.2014.08.004. Hernández-Molina, F.J., Larter, R.D., Thomas, E., Pérez, L.F., Eagles, G., Bohoyo, F., Lodolo, E., Chuang-Xuan, X., Dalziel, I.W.D., Stow, D.A.V., Escutia, C., Biddle, J., Sijp, W., Harwood, D., Tassone, D.A., 2016. Onset and development of the Drake Passage and Scotia Sea gateways and its influence on global ocean circulation and climate (IODP proposal). Geo-Temas, 16 (2), 601-604. Pérez, L.F., Hernández-Molina, F.J., Esteban, F., Tassone, A., Violante, R., Piola, A.R., Maldonado, A., Lodolo, E., 2014. Middle-Slope Terraces in the Northern Scotia Sea and Southern Atlantic Ocean: Palaeoceanographic Implications. VLIZ Special Publication 69, 39-40. Maldonado, A., Acosta, A., García, M., Lobo, F.J., Martos, Y., Pérez, L.F., Puga, E., Bohoyo, F., Casas, D., González, F.J., León, R., Medialdea, T., Somoza, L., Galindo-Zaldivar, J., Larrad-Revuelto, M., Rey-Díaz de Rada, J., Bozzano, G., Elizondo, M.E., Esteban, F., Pelzmajer, M., 2013. Dredged rock samples from the southwestern Scotia Sea (SCAN 2013): remnants from the South America-Antarctic continental bridge. Bollettino di Geofisica teorica ed applicada, 54 (2), 330-333. Pérez, L.F., Hernández-Molina, F.J., Esteban, F., Tassone, A., Piola, A., Maldonado, A., Lodolo, E., 2013. Contourite features in the Northern Scotia Sea: tectonic, sedimentary and palaeoceanographic implications. Bollettino di Geofisica teorica ed applicada, 54 (2), 337. Pérez, L.F., Hernández-Molina, F.J., Bohoyo, F., Maldonado A., Vázquez, J.T., Lobo, F.J., Martos, M.Y., 2011. Distribución del espesor sedimentario en las cuencas Protector y Pirie (Mar de Scotia, Antártida): factores de control. Geogaceta, 50 (2), 133-136. Lobo, F.J., Hernández-Molina, F.J., Maldonado, A., Galindo-Zaldívar, J., Bohoyo, F., Martos-Martín, Y., Pérez, L., Rodríguez-Fernández, J., Vázquez, J.T., 2010. Furrows and channels in Scan Basin, southern Scotia Sea: tracking the path of the Weddell Sea Deep Water? Geo-Temas, 11, 105-106. Martos-Martín, Y., Bohoyo, F., Galindo-Zaldívar, J., Hernández-Molina, F.J, Lobo, F.J., Maldonado, A., Pérez, L.F., 2010. Shallow crustal structure and evidences of bottom current flows imprinted on contourite deposits of the SW Scotia Sea basin (Antarctica). Geo-Temas, 11, 117-118. Pérez, L.F., Hernández-Molina, F.J, Bohoyo, F., Maldonado, A., Vázquez, J.T., Galindo-Zaldívar, J., Lobo, F.J., Martos-Martín, Y., 2010. Contourite deposits in Protector Basin (Antarctica). Geo-Temas, 11, 135-136. WAMSISE: West Antarctic Margin Signatures of Ice Sheet Evolution (H2020-MSCA-IF-GF-2017 no. : 792773 WAMSISE).